I read an article about a Bossk focus collector’s top ten favorite items in her collection, and figured it might be fun to do the same with mine. However, I’m not going to include any of the one-of-a-kind items like original art or custom figures. I love them, but it seems to me that it’s more useful for other people reading if I choose things that they might actually be able to buy. Plus it’s too hard to choose a favorite. I’m also only including things that actually include Jabba (as opposed to another character from his palace) so that means the Sideshow Life Size Salacious Crumb won’t be included even though it’s definitely one of my favorites. Even so, this was definitely not an easy list to make. There’s just something about this statue that makes me smile. And it’s definitely got a unique style. I love the fact that they made a Play-Doh playset for a character who is supposed to be a disgusting alien gangster. It’s pretty fun to play with, too. At least if you have a kid. I really find this bottle to be charming. It kind of reminds me of a smiling Buddha statue or other idol, which is one reason why I repainted my extra one in a faux bronze finish. #7: Silver Jabba the Hutt Ring by JAP Inc.
Part of what attracts me to Jabba merchandise is the fact that Jabba himself is essentially a gigantic frog-slug, and yet there are hundreds if not thousands of products with his image on them. One good example of this is this sterling silver ring, which I love as an art object, but would never actually wear. This hat is similar to the ring above. I love it, but I can’t ever imagine wearing it in public. It’s everything that a Jabba the Hutt hat should be. But I think my affection for it is at least partially due to the circumstances under which I bought it. As I mention in the main page for the hat, I just happened to be in Japan at the exact right time to pick up one of the few that were manufactured. I like Galactic Heroes in general, but the Jabba-related ones are particularly good, in my opinion. Jabba himself is cute, and I’m a sucker for anything that makes Jabba cute. But they also have a large number of the characters you’d want for a Jabba’s Palace display, which makes it pretty fun to play with (again, if you have kids). I just with they had a Sy Snootles and Rancor Keeper, and maybe a few of the more exotic palace aliens like Amanaman. Once the Jabba’s Palace wave of Kubricks is released, these may have a contender for the “cuteness crown” but I think the Galactic Heroes will always have Kubricks beat when it comes to variety and playability. There is a special place in my heart for the vintage Kenner Jabba playset. It was my first Jabba collectible, and it’s a great toy besides. 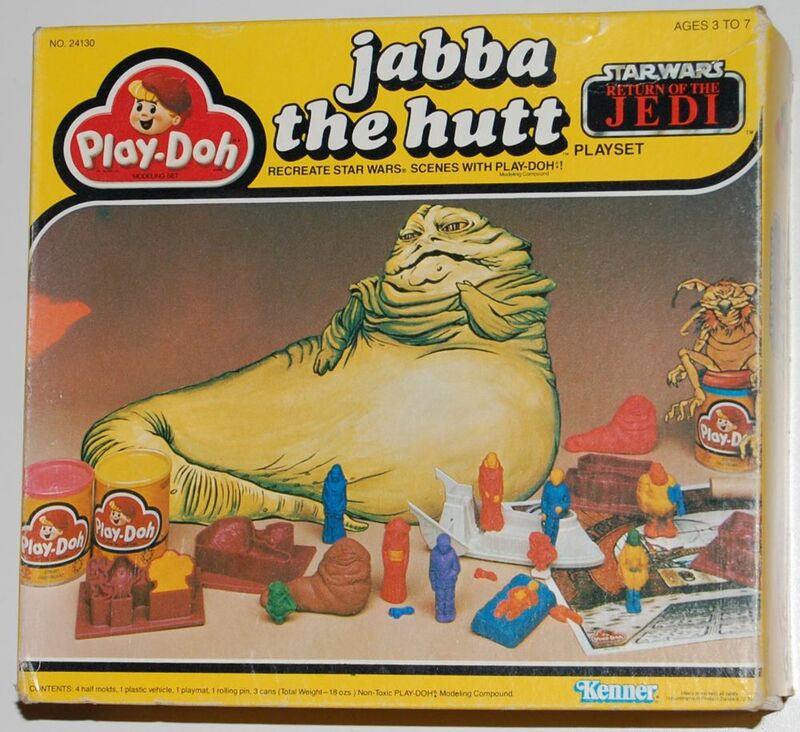 It’s ironic that subsequent Jabba toys still haven’t really topped it. It’s very tough to decide how to rank the Sideshow and Gentle Giant Jabba setups. While the Sideshow Jabba has the most accurate Jabba sculpt ever, the paint on him and the throne could be better. (I have a repainted version of Jabba that I actually use for display on my throne). And in the end, I also docked the Sideshow set a few points for its size, which while impressive, makes it very difficult to display. It’s a fantastic setup, though, and can be had relatively cheaply now on the secondary market as people discover that they don’t really have the room to display it. Sideshow has already released two accessory packs and a Han in Carbonite, and has said that we will be seeing a Rebo Band sometime in the future, so this set will continue to get better as time goes on. As I said above, the Sideshow Jabba has the most accurate sculpt ever. This one looks a little strange. It’s probably a combination of the paint and the sculpt, but in any case, he looks almost stoned. However, every other component of the set is top notch. I love the paint on the throne, the tiny extras like pillows and a plate and cup that you can move around (but are attached with magnets), and the extra characters you get like Oola, and the Jawa. (Salacious Crumb and Bib Fortuna don’t come with the basic set, but they are available.) It’s also a reasonable size. You can display it on a normal shelf, unlike the Sideshow version. But finally, the fact that you can get a Slave Leia, the Rebo Band, a Rancor, and (soon) a set of sculpted “bookends” that are all in the same scale really helps to make this an impressive set. When I got this last year, I wouldn’t have expected that it would make the top of my list. But there’s just something about this statue that I really like. I have it near the door to my office and so I look at it every day. It’s definitely not the most accurate Jabba in terms of either its sculpt or its paint, but it has a lot of personality. And the size makes it really impressive. I know I docked the Sideshow setup for its size, so it may seem strange to be talking about it as a positive here, but that’s how I feel. I’d love to get the rest of the setup, including the Gamorrean Guard, Bib Fortuna, and Oola, but that will have to wait until I have someplace to put them (not to mention the money). Funny you should put the Attakus at the top, because I agree it is truly wonderful (even if not the most accurate). Capturing his personality and character seems more important in a way (and my objection to the use of cgi might include ‘lack of personality and presence’ rather than ‘not looking like the original’). I saw one of those Jabba rings (#7) in Japan, but couldn’t afford it, and anyway, would never wear it. A very fine piece, though, and we met the guys who made it, etc. Yes, the rings were very expensive originally, but haven’t held their value very well. The same can be said of the Attakus statue, and almost all of this stuff, actually. That’s good for me, since I started collecting relatively late. I’ve been able to get things for much less than the original retail in many cases. I think it’s just the nature of Star Wars collectibles. Only a small percentage of the Star Wars things released actually hold their value, and even fewer increase in value. You went to Japan for Celebration Japan, I assume? How did you like it? I lived in Japan for 5 years, but didn’t get to go to Celebration. Great list icruise. It’s nice to see the Attakus version come out top, as i’ve always had a bit of a soft spot for their stuff. FOREVER THE HUTT WILL RULE!!!!!!! !